When:Tuesday, October 16. Early - 6:00 doors, 6:30 show. Late - 8:30 doors, 9:00 show. Details:On-sale now! Don't miss out on seeing our new feature length film with Jeremy Jones. Bozeman, get ready. 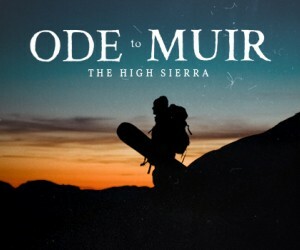 On Tuesday, October 16, join us at the Emerson Center for the one-night-only premiere of our new feature-length snowboarding film, Ode to Muir. Ode To Muir pairs professional snowboarder and founder of Protect our Winters Jeremy Jones with two-time Olympian Elena Hight as they embark on a 40-mile foot-powered expedition deep into California’s John Muir Wilderness. Their journey balances the challenges of winter camping and grueling climbs to snowboard the Sierra’s unnamed peaks, with personal reflections on the importance of the natural world. The film ultimately contemplates the perspectives gleaned from past protectors who fought to preserve a great American Wilderness.